We in the United States are trapped in a viscous cycle when it comes to the cost and burden of higher education. As Matt Taibi describes in his 2013 article “Ripping Off Young America”, the federal government has discovered it can make obscene amounts of money through the collection of student loans (The Rolling Stone). With the government providing easy access to credit, accredited schools are unchecked as they raise tuitions at an exponential rate. Indeed, “costs have been rising at roughly three times the rate of inflation over the last couple of decades, three times the rate of the consumer price index” (Democracy Now!). Student debt in America has well surpassed 1.2 trillion dollars and the weight is bearing down heavily on the working class, particularly the younger generation of workers. Such a burden is utterly crippling, with many people reporting desperate forays into criminal markets, funds automatically extracted from disability checks and stalkeresque harassment from anonymous debt collectors, among other abuses (Democracy Now!). This is all against the backdrop of rising unemployment and a pathetic federal minimum wage, tokens of an economy where many struggle to pay rent, let alone a hefty loan repayment. But some former students have decided to fight back. The self-titled “Corinthian 15” are former students of Corinthian Colleges, for-profit universities that are currently under government investigation for predatory lending (Democracy Now!). The former students have refused to continue paying off their debt, inspiring many more to join the strike and drawing massive attention to the sickness of the student lending industry. The work they are doing provides perfect kindling for a massive debt strike to reject the predatory spiral of student debt. In an open letter to the Department of Education (DoE), the students claim: “We paid dearly for degrees that don’t pay a living wage. We can’t and won’t pay any longer,” giving voice to the reality of millions (CNN Money). But they aren’t stopping at refusing loan repayment. The Corinthian 15 are now posing a legal challenge to the recent decision made by the Consumer Financial Protection Bureau (CFPB) and DoE to grant “partial forgiveness” of $480 million of Corinthian’s private loans. Not only does this amount fail to cover a significant portion of the universities’ loans, but it does not include federal debt at all (Salon). The Corinthian 15 are taking this to the courts, pairing up with the organization Debt Collective to challenge the DoE under something called the “Higher Education Act (HEA) of 1965.” This mandate allows students to demand debt forgiveness if “the school did something wrong or failed to do something that it should have done” (HEA, 1965). This may seem like an easy win considering the fact that the DoE’s own lawsuit against Corinthian provides evidence of wrongdoing. Nonetheless, the process is drastically unclear and underused and is expected to take years (Salon). In the era of Citizens United, massive lobbying and blatant collusion between major corporations and government, it may seem like there is little we can do to make change. We must remember the power we have in numbers. Markets are genuinely threatened when workers refuse to participate, whether the target is student debt, steel production or Walmart. Moreover, with more than 40 million Americans lugging around student debt, large-scale resistance would be impossible to ignore (Experian Credit Bureau). The Corinthian 15 debt strike and other similar actions have the potential to inspire and blossom into concerted mass resistance. Refusing to pay is a powerful tool to challenge the system that continues to carelessly drown us in debt, but this must be linked with an organized effort to achieve the total elimination of student debt. Debt striking should be combined with grassroots organizing, media campaigns, direct action and solidarity with other working class issues and low-paid workers at universities. A wide range of people will be encouraged to participate as we work to build a movement that can demand real change. The Boston area is one region that is particularly ideal for building such a movement. With 53 schools in the region and 66% of attendees leaving with student debt, the burden is felt heavily here (Boston.com). Proximity between schools makes mass mobilization readily realizable and we certainly have the numbers. Boston is home to the largest relative population of 20-34 year olds in the country (WGBH). Moreover, Boston is looked upon as a national education hub, so taking a stand here has the potential to create waves throughout the country. Student debt evidently affects millions outside of the Boston area and we should support wherever organized resistance arises. But we have a lot of power here in Boston. We have the numbers to fight back and deny paying any more money to the system that treats us as nothing more than consumers. For more information on how to get involved, check out Socialist Alternative, Strike Debt!, Debt Collective and The Rolling Jubilee. Rising student debt is indicative of underlying systemic issues in how we organize higher education. Schools accredited by the DoE, which is required for federal funding, have total control over market prices in higher education. If it is left up to them, tuitions will continue rising through the roof. And all this without any significant effect on unemployment and job quality. The money raked in mostly goes towards expanding administrative bodies made of “sub-provosts and provosts who make six-figure incomes”, all while their student “customers” suffer a lifetime of inescapable debt. In a gross carousel of capitalistic waste, universities spend more and more on endless renovations and contracting to make the school appear worthy of even more pointless profits (Democracy Now!). On top of that, universities are transitioning to part-time work for lower paid employees. At many schools, custodial and dining jobs are being contracted out to management companies that prioritize lowering costs (ACUI). Universities do this to pay less for the same service. Some of this already reduced budget goes to the contracting company, so workers are seeing less pay and greater chances of hour reduction and job cuts. Schools have also been relying more and more on adjunct and part time professors. Part time and adjunct professors professors across the country have been unionizing to demand fairer pay and much needed job security (Adjunct Nation). A massive movement against student debt could work alongside resistance from low-paid university employees, as they share the burden of oppression by these institutions. 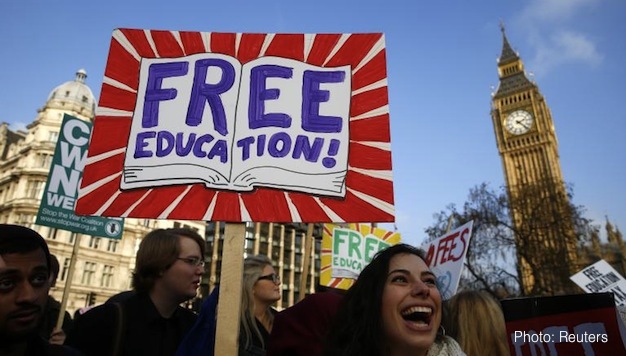 The government stands to make $185 billion from student loans by 2023, which appears farcical considering that an investment of $15 billion could make every public 2 and 4 year university in the US tuition-free for all (Strike Debt!). This degree of short-sightedness and grave mismanagement is made possible, if not inevitable, in the haphazard capitalist economy that values generating profit over providing citizens with the education that is their basic right. In a planned economy devised collectively and democratically, free quality education could be made a top priority.